The Expat Compass: Zaha Hadid Architects to design Navi Mumbai international airport. 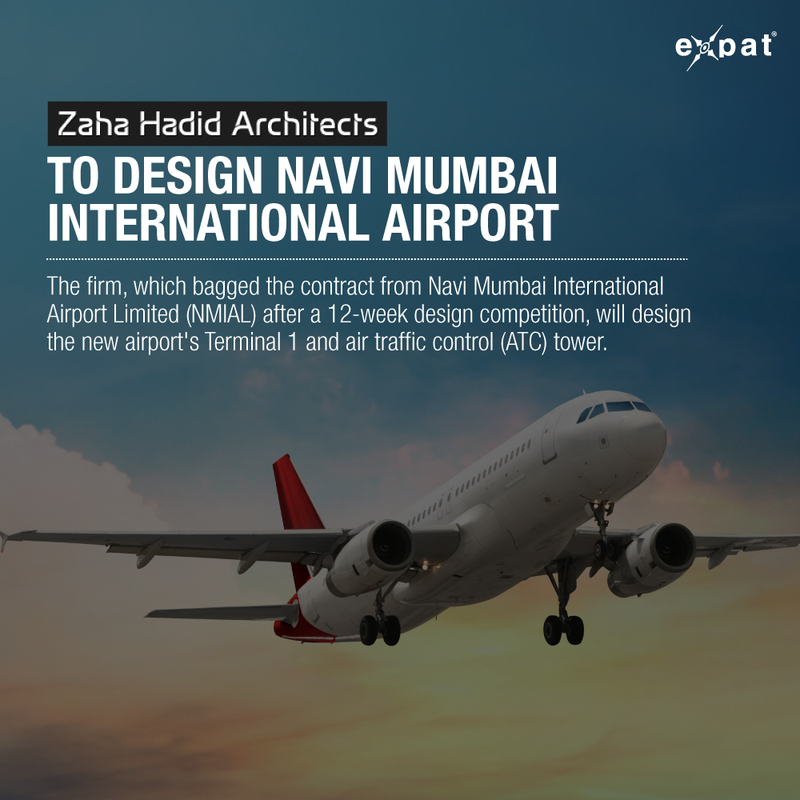 Zaha Hadid Architects to design Navi Mumbai international airport. The firm, which bagged the contract from Navi Mumbai International Airport Limited (NMIAL) after a 12-week design competition, will design the new airport's Terminal 1 and air traffic control (ATC) tower. British architecture firm Zaha Hadid Architects (ZHA) has secured the mandate to design the much-delayed Navi Mumbai international airport, being developed by the GVK group-led NMIAL. The firm, which bagged the contract from Navi Mumbai International Airport Limited (NMIAL) after a 12-week design competition, will design the new airport’s Terminal 1 and air traffic control (ATC) tower, according to a statement on Wednesday. This will be Zaha Hadid’s first major project in the Indian sub-continent. The work on the Rs 16,700-crore Navi Mumbai international airport kick-started last month with Prime Minister Narendra Modi laying the foundation stone for the first phase of the project on February 18, after more than two decades of its being conceived. Planned in 1997 as a secondary airport to meet the growing needs of Mumbai, the project was inordinately delayed due to a myriad of factors, including political indecision, issues of environmental clearances and the funding. “We are committed towards bringing the best global practices from the industry to design, engineer and build this most awaited (Navi Mumbai) airport project in India. “Therefore, we decided to go with ZHA, a firm known for its path-breaking and remarkable architecture. It also has the expertise of delivering a world-class airport design through a highly professional team,” said GVK Reddy, founder and chairman, GVK and chairman NMIAL. The first phase of the Navi Mumbai airport is likely to be completed by the end of 2019, with one runway and the terminal building ready, and will handle up to 10 million passengers per annum. The second phase, to be completed by 2022, will take the handling capacity to 25 million passengers. The third phase will be completed by 2027, and at the completion of the fourth phase by 2031, the handling capacity will increase to 60 million passengers. Established in 1979, ZHA has a portfolio of over 950 projects spread across 44 countries. It has designed Beijing’s under-construction Daxing airport terminal, spread over 700,000 square meter, besides designing Olympic Aquatics Centre in London, the Al Wakrah Stadium in Qatar for the 2022 Football World Cup, the Guangzhou Opera House in China and the MAXXI Contemporary Arts Centre in Rome, among others. The City Industrial Development Corporation (Cidco), which is developing the new airport along with GVK Group, expects the first flight to take off in 2019. The GVK group, which will invest nearly Rs 4,000 crore in the first phase, will hold 74 per cent stake in the project, with the rest being held by the Cidco and the Airports Authority of India. The eye-catching architectural style of the late Zaha Hadid continues to make waves across the world.